‘Geologists are by force of circumstances interested in scenery; or is it that an interest in scenery often promotes an interest in geology?’—B W Collins, New Zealand Journal of Geology and Geophysics 1965. This exhibition brought together the work of two men, earth scientist Sir Charles Cotton (1885 – 1970) and artist Colin McCahon (1919 – 1987) in acknowledgement of the role played by C.A. 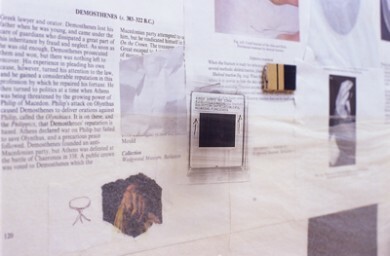 Cotton’s publications in the ideas and work of McCahon. At the end of the 1930s, McCahon was striving to simplify his representations of the New Zealand landscape. An increasing awareness of the range of practices and styles of abstraction employed by European artists was filtering through to New Zealand. McCahon was one of the first to explore these developments in his own work. Formal simplification allowed McCahon to assert an increasing orderliness, a sensibility he felt was necessary to seeing the land. A simplicity and harmony is evident in the finished Otago landscapes from 1939 – 1940. To achieve a pictorial representation of his understanding of the land, McCahon manipulated perspective and form to emphasise or summarise landscape features. Pictorial depth was replaced with a modernist attention to material and formal qualities. McCahon took licence with representation of the land, eliminating or shifting and accentuating forms to suit his desired image. In the search to give his images of the land more solidity and clarity, Geomorphology, the study of the physical features of the Earth/or the arrangement and form of the Earth’s crust, was to provide some answers. The widespread appreciation of landforms in New Zealand is indelibly linked to Sir Charles Cotton–a man unto himself, shy and retiring, but an exceptional scholar who achieved international recognition during his time at Victoria University of Wellington between 1909 and 1953. In 1921, Cotton at the age of 36 was promoted from lecturer to Professor of Geology at Victoria University College. At this point in his academic career he had published 30 papers and had clearly established himself as the undisputed leader of geomorphologic studies in New Zealand. The year 1922 saw the publication of his first and most influential book Geomorphology of New Zealand. Almost immediately the work was recognised as something new and dynamic. It quickly became the standard textbook for students and working geologists alike and was widely acclaimed overseas as an exceptionally clear exposition of the general principles and applications of the study of landforms. The impact of the book was largely determined by the fact that it was copiously illustrated with diagrams, landscape sketches and half-tone pictures of local scenery. Many taken from Cotton’s scientific papers, all 442 figures provided tantalising evidence of the remarkably compact diversity of landscape features in New Zealand. Many of these illustrations form part of the scientist’s contribution to this exhibition in the Adam Art Gallery. They bear evidence of an enthusiasm for the New Zealand landscape, as expressed by Cotton as early as 1918; ‘The shores of New Zealand are a veritable treasure house of beauty, rivalling in their charm the glaciers of the southern island, the geysers of the northern, and the mountains, lakes, and gorges of both. What a story it is that these fascinating coasts reveal!’. Cotton’s life work was devoted to unravelling this story through word and illustration, and he achieved this almost single-handed. According to Cotton: ‘Until I came to Wellington in 1909 my knowledge of geomorphology was absolutely nil. I had, however, discovered W. M. Davis [William Morris Davis, former Professor of Physical Geography at Harvard University], and from 1909 to 1914 I read every word (I could get hold of) that he had written. This refers not so much to the early “classic” papers, which are criticised ad nauseam – favourably and unfavourably – but to the articles that were then coming from Davis’s pen; I learned my geomorphology from its written words, more than from personal contacts’. ii). isometric block diagrams or composite diagrams (usually labelled) illustrating the sequential development of landforms. Despite the fact that Cotton’s lectures have been described as undemonstrative, his use of simple, uncluttered line drawings and block-diagram sequences to convey the notions of evolutionary change in the landscape, allowed students to begin to see and understand landscape for the first time. This undoubtedly contributed to the popularity of the subject both in and out of the university environment—Prof. Rodney Grapes. “I was interested in Cotton through having lived in North Otago for 2 years & having already started my love affair with the place. Cotton told me about it. Nobody told me about Cotton, I just found him on a bookshelf”. The War years were to mark a milestone in Cotton’s creativity with the publication of three books; Landscape in 1941; Climatic Accidents in Landscape Making in 1942 and Volcanoes as Landscape Forms in 1944. These, together with the 3rd revised edition of Geomorphology, that appeared in 1942, make up the quartet of books for which Cotton is known as one of the world’s outstanding geomorphologists. In addition to Cotton’s original sketches, he also made a large number from photographs or from sketches drawn by overseas geomorphologists. These are particularly abundant in his books Climatic Accidents, with 74 sketches, and Volcanoes as Landscape Forms, with 73 sketches. Most of Cotton’s characteristic block diagrams appear in Geomorphology of 1922–again 73 in number. In Landscape published in 1942, 34 additional block diagrams were given together with an additional 38 sketches from photographs. Thus, in the 33-year period between 1911 and 1944, Cotton produced 422 pen and ink drawings. Even when he retired from the Chair at Victoria University in 1953, Cotton’s drive for publication and research continued unabated. He continued writing scientific papers that were illustrated by sketches and block diagrams up to 1971. His last paper on the weathering and retreat of precipitous was published a year after he died in 1970 at the age of 85. In total, Cotton’s line drawings amount to almost 600. They stand as a tribute to the unequalled lifetime work of one man. To him the features which defined the landscape were unfinished, ephemeral products. The agencies affecting changes of form were everywhere at work both simultaneously destroying and creating the landscape around us. His interpretative sketches are a clarification that clears the landscape of its overlay of vegetation, farms and houses to expose the underlying structure of the land and in doing so capture a moment of geological time—Prof. Rodney Grapes. In correspondence Ron O’Reilly recalled McCahon discussing Cotton’s book Geomorphology in relation to Takaka (late 1940s) and North Otago (late 1950s) paintings and making associations with the geological and geographical forces that shaped the New Zealand land. McCahon was looking to achieve a solidity of form, which at times resolved into geometric shapes, heavy outlines or blocks of colour. While Cotton’s drawing was uniform in style (he reused many drawings across various publications in his career), McCahon continuously worked at, and struggled with, the means and form of his visual communication. By 1948, a year after The Caterpillar Landscape, McCahon was ‘fighting his black outline fiercely’. His style of painting altered as McCahon strove to paint the land ‘colour for colour and form for form’. At the same time he was interested in indicating the forces that had been at work in shaping the land and its significance for the future. By the later 1940s, the landscape was suggested rather than depicted. Earth and sky became distinguished by fields or zones of colour. Hills were defined in profile, against a flattened landscape rising vertically to the sky. All redundant detail was removed, just as, in his drawings, Charles Cotton ignored built features, trees and objects irrelevant to his scientific themes. However, McCahon was not just capturing a sense of geography. Land was always connected to human existence, even when it appeared unpopulated. McCahon’s multi-panel works, such as Triple Takaka (1948) take the viewer on a journey through the landscape. Cotton’s explanations of geographical structures provided information in addition to the memories and ideas on which the paintings were based. Indicating the development of geological features, Cotton’s hand-drawn sequential diagrams were comprehensible and concise summaries of aspects of the land, especially those peculiar to New Zealand. One of the most endearing aspects of Cotton’s work is his landscape sketches. These are particularly distinctive and possess a simplicity of style that reflects his skill as a landscape artist. A letter from Japan commemorating the 80th birthday of Sir Charles Cotton mentions that ‘…we (i.e. Japanese geomorphologists) especially entertain friendly sentiment for his sketches, which sometimes remind us of pictures drawn in Chinese ink—of the Southern China School’—i.e. monochrome ink painting. Of his 65 published landscape sketches, 46 were drawn in an eight year period between 1911 and 1919 (1911 – Wellington (3); 1912 – Kaikoura coast, Marlborough (12); 1914 – Paekakariki, Bay of Islands, Banks Peninsula, Otago coast (5); 1915 – 1916 – Central Otago, Canterbury, northwest Nelson (19); 1918 – Fiordland, Auckland (6); 1919 – Lake Taupo (1)). Except for 2 sketches in 1921 (Lake Taupo and Mayor Island), ten sketches of the remaining seventeen were drawn in 1928-29. During this time Cotton visited the British Isles, parts of the continent and Norway, Spitzbergen, and Germany on a German cruise ship where he observed, sketched and photographed glacial and fiord landscapes. The remainder of his published sketches were drawn between 1941 and 1963 (1941 – Wellington (2); 1942 – Central volcanic area, North Island (1); 1946 – Wairau Valley, Marlborough (1); 1948 – Mohaka Valley, Hawkes Bay (1); 1957 – Otago coast (1); 1963 Bay of Islands (1))—Prof. Rodney Grapes. Cotton’s heavily illustrated and comprehensible publications were responsible for promoting an understanding of the geology and geography of New Zealand to both scientists and general readers. His work received international acknowledgement and is to be found on many domestic bookshelves, and in some artists’ studios, in this country. Although he took little part in public life, avoiding rather than seeking publicity, Cotton holds a special position in New Zealand science. He is one of few to have been knighted solely for scientific achievements. The citation for this high honour succinctly sums up his contribution to New Zealand science: ‘For outstanding service as a geologist in New Zealand, particularly as a Professor of Geology at Victoria University of Wellington, and for research and publications of international repute’. Cotton’s publications highlighted and clarified geomorphological features. Sectional diagrams and sketches of underlying strata, segmentation and composition of the earth, documentation of water features, supplemented by detailed photographic evidence and aerial views (including his own photographs), offered an encyclopaedic array of landscape images and knowledge. A small number of works indicating bare, undulating hills against the flat horizon, such as The North Otago Landscape as described by Prof. C.A. Cotton and seen by Colin McCahon in 1972, while similar in form to other North Otago landscapes McCahon painted in the late 1960s, are seemingly motivated by McCahon’s recollections on Cotton’s publications. These remembrances were instigated by Cotton’s biographer, BW Collins, of the Dept. of Scientific and Industrial Research, enquiring through Ron O’Reilly. McCahon’s response is outlined in the letter of 31 August 1972. Rethinking Cotton’s importance, McCahon acknowledged the site of his first encounters with Cotton’s books, his much-beloved North Otago, and a fruitful coming together of scientific and creative interests. *Quotations taken from McCahon’s correspondence to R.N. O’Reilly dated 31.8.72 and Colin McCahon at the Dowse Art Gallery, Dowse Art Gallery catalogue 1980. The Adam Art Gallery gratefully acknowledges the assistance of the lenders, Matthew O’Reilly, Paul Cotton, Professor Rodney Grapes, Eamonn Bolger and the National Library Gallery towards the realisation of this exhibition.